One of the works published along this year by the MAPIR group is bringing an important attention from the social media. 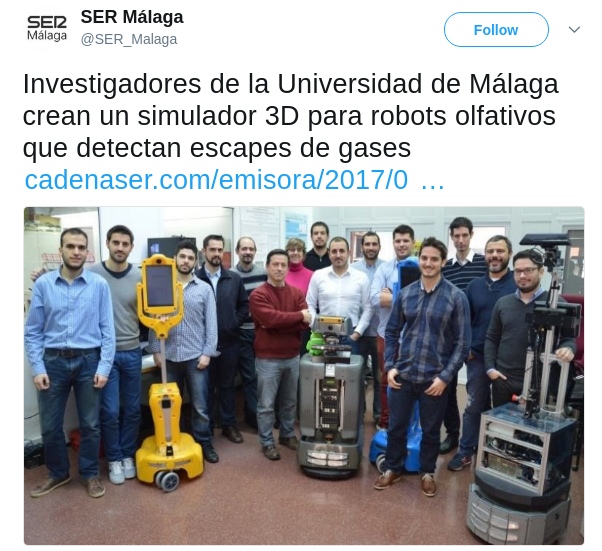 The work, GADEN: A 3D Gas Dispersion Simulator for Mobile Robot Olfaction in Realistic Environments presents a simulation framework fusing mobile robotics and gas dispersion theory to ease the development of new algorithms and methods in this field. In this ocassion was the SER radio station who interviewed one of the authors, and then published the new in twitter (in spanish).